Summary of Endrew F. Decision 2017 - The Law Offices of Ellen A. Callegary, P.A. by Ellen A. Callegary, Esq. On Wednesday, March 22, 2017, the U.S. Supreme Court determined that, when providing special educational services to students with disabilities, school systems cannot simply ensure that a student makes minimal or trivial progress from year to year, but instead must ensure that students make meaningful progress, given the student’s circumstances. Endrew F. – or “Drew” – was a student diagnosed with an Autism Spectrum Disorder at age two. He attended school in his local school system, Douglas County (Colo.) School District, from preschool through fourth grade. The school system developed Individualized Education Programs (IEPs) for Drew each year. Drew exhibited multiple behaviors that affected his academic progress and his ability to access instruction, including screaming in class, climbing over furniture, climbing over other students, and running away from school. Drew exhibited severe fears of flies, spills, and public restrooms. Drew’s IEPs repeatedly carried over the same goals and objectives from one year to the next. In April of Drew’s fourth grade year, the school system presented a proposed IEP to be implemented during fifth grade. Drew’s parents concluded that the proposed IEP was substantially identical to his fourth grade IEP, which had been ineffective in addressing his behaviors or his academic needs. As a result, Drew’s parents unilaterally placed him in a nonpublic school specializing in educating children with Autism Spectrum Disorders. The nonpublic school implemented a Behavioral Intervention Plan that proved effective in addressing Drew’s most frequent interfering behaviors. Drew made significant behavioral and academic progress. The nonpublic school was also able to provide Applied Behavior Analysis and speech-language services that Drew had not received in his public placement. In November of Drew’s fifth grade year, his parents attended a meeting with the school system to consider another proposed IEP, but concluded that IEP was substantially the same as what they had rejected seven months earlier. In particular, they were concerned that the school system’s proposal did not incorporate effective elements of the nonpublic school’s behavior intervention plan. His parents rejected the school system’s second proposed IEP and requested that the school system reimburse them for his placement at the nonpublic school. In 2012, Drew’s parents filed a due process hearing request. During a hearing, they presented evidence and argued that the evidence indicated that Drew had made “little to no progress” during his enrollment in the school system. The administrative law judge disagreed, and found that the school system had provided “some” educational benefit, which was all it was obligated to provide. Drew’s parents appealed to the U.S. Supreme Court. 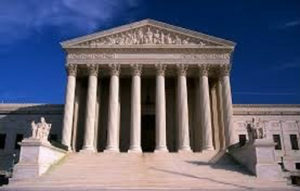 In a unanimous decision, the Supreme Court ruled 8-0 to overturn the Tenth Circuit’s decision. The Court took the opportunity to reexamine the holding in Board of Ed. of Hendrick Hudson Cent. Sch. Dist. v. Rowley, 458 U.S. 176 (1982), the first case in which the Supreme Court examined the requirements of the Individuals with Disabilities Education Act (IDEA). As a result, the Court only considered the circumstances in the Rowley case, which involved a child who was able to participate in her general education classroom with accommodations for her deafness. The Court did require an IEP to be “reasonably calculated to enable the child to receive educational benefits,” and for students in general education classrooms, that generally entailed achieving “passing marks” and advancing from grade to grade. Justice Roberts, in considering the standard applied by the Colorado school district, referred at length to the Rowley Court’s discussion of Congress’ goals in passing the IDEA: “the essential function of an IEP is to set out a plan for pursuing academic and functional advancement. This reflects the broad purpose of the IDEA, an ‘ambitious’ piece of legislation enacted ‘in response to Congress’ perception that a majority of handicapped children in the United States “were either totally excluded from schools or were sitting idly in regular classrooms awaiting the time when they were old enough to drop out.”’” (Internal citations omitted). In arguments before the Court in the current case, the Colorado school system argued that any educational benefit was sufficient to confer some educational benefit. As a result, the Court rejected the conclusion by the Tenth Circuit and the Colorado district court that any minimal or trivial progress meant that the school system had met its obligations. The Court remanded the case back for consideration by those lower courts. Note for the Future: The Court still declined to impose a clear formula to determine whether a student was receiving “sufficient” educational benefit. As a result, the question of what constitutes “appropriate progress” or “sufficient educational benefit” will likely still be the subject of disputes between parents and school systems in IEP Team Meetings and in administrative and judicial proceedings. If you have questions or comments, please contact Ellen Callegary at Ellen@CallegaryLaw.com or Jim Silver at James@CallegaryLaw.com or call us at 410-576-7606.
specific situation should seek the services of a competent attorney. © This document is copyright 2017, The Law Offices of Ellen A. Callegary, P.A. It may be copied and distributed without additional permission, so long as it is attributed to The Law Offices of Ellen A. Callegary, P.A. and no fee is charged. “Navigating Guardianship and Its Alternatives” – presented by Ellen A. Callegary, Esq.